Company vs Freelance for Web Development: what to choose? The excitement of coming up with an idea for an amazing new website may as well disappear as soon as one realizes how much developing effort is required to make the dream come true. For better or worse, no matter how grand or concise your idea is, its implementation means much developer’s work. Of course, it seems like the uniqueness of a concept matters the most, but what about the execution? Here is exactly where problems may appear. Who can be trusted with the creation of your web solution? Who to build cooperation with? Should it be an independent software developer? Or a whole company that is specialized in the web development? Let us take a look into the core of the problem to try and answer all of these questions correctly. What is a web development in general? Basically, it is a complicated process of creating a website. This process consists of several stages, and each is important: web design, web development, scripting, content creation etc. Every part of this process should strictly meet your (employer) expectations and requirements. So, a person or a team you are going to hire has to be proficient and skilled enough to handle all of the specifics of such work. The complicated process of web development is a thing you cannot just avoid on your trip towards success. But experienced IT professionals are able to make your trip easy and enjoyable. So, Freelance Developer vs. Development Company: who would win? Wrong choices are often made only due to a lack of a clear understanding of the question. 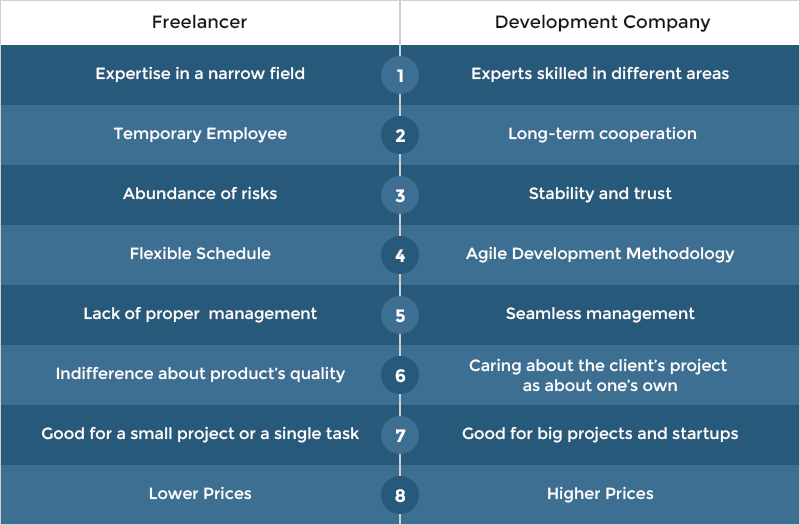 This is why a detailed review of pros and cons of cooperation with freelancers and IT development companies would be of great help for you. A freelancer is a person that works independently for any hiring company (or companies). All of the client’s tasks in this case are performed remotely. In fact, freelancer works from home and gets his payment as a fee for a certain service. Freelancing isn’t easy, especially if a person starts the path as an independent worker initially. So, skilled freelance developers pay much attention to their portfolio. And in most cases, they are able to provide an impressive collection of cases for potential employers. It is necessary to gather feedback and recommendations to hold up to the impeccable reputation. These short notes from former clients can tell you a lot about a freelance worker. The portfolio overviews the projects; recommendations highlight all the specifics of cooperation with a certain person. In most cases, it is cheaper to hire a freelance developer than a development company. However, indicating your potential employee’s financial expectations can also describe their level of competence . For example, a freelancer offering a price that is below average on the market might as well lack in experience or have some technical weaknesses. Also, the way a person builds communication with a potential employer is an important moment. An interested professional always responds on time and tries to get as much information as possible. Poor, time-devouring feedback is almost sufficient enough a reason for you to forget about the cooperation with the person. As large a number of people who work on the freelance basis as there is, each is trying to demonstrate their own professionalism and win more attention. So, the review of a freelancer’s active participation in different discussions or blogs can serve as a forward estimate. So, let us define some pros and cons of such kind of cooperation. The prices freelancers charge are definitely lower than those suggested by the development companies. Actually, it is the main advantage of cooperation with freelancers. 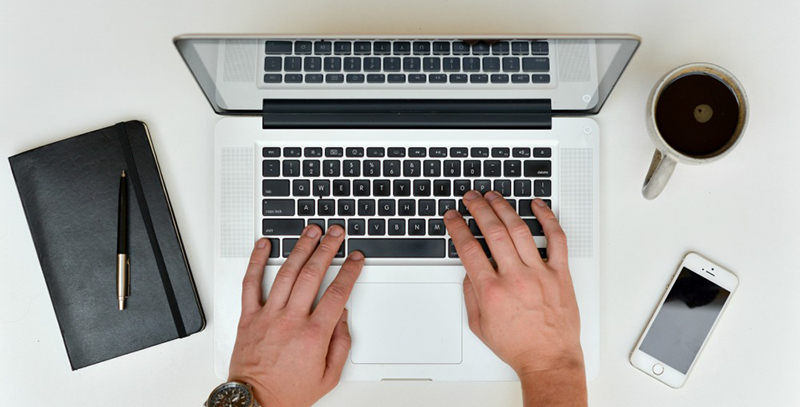 As freelancers work independently, each of them is able to offer you only the specific skills. If you need a project that differs drastically from those that are described in a freelancer’s portfolio, some risks appear. A freelance person usually works whenever required. The flexibility of a schedule is a nice advantage if a client and a developer are situated in different time zones. On the other hand, there are always some cons. As we said, freelancers are independent. They can personally decide which projects to work on, and the number of these projects at once can be huge. You never know when a freelancer can decide to say “Goodbye”. Or just leave without saying anything at all. You cannot fully control their work and make sure that an employee works on your tasks at the moment. Also, freelance developers may have problems with organization and time-management. So, managing such employees is pretty peculiar and risky. Freelancers are mostly interested in their own profit and success, not in yours. This is why some of such workers try to finish your project as soon as possible without paying too much attention to such crucial detail as quality. Another important thing is that a freelancer would just disappear once the website starts running. And you might have to look for them again if some questions or support needs appear.. Even though nowadays the market is full of dedicated freelancer platforms, it is still hard to find a real professional. There are almost always risks. Of course, you can save money hiring a freelancer. But just imagine: how much would you lose if your developer unexpectedly disappeared? Don’t forget that there are situations when you need to hire several freelancers: front-end developer, back-end developer, and QA engineer. You can never be sure that those three would work well together. There is always a chance for some miscommunication, misunderstanding, and mess in general. Companies are interested in providing a full cycle of high-quality services over the long term. From the consulting to the technical support of the project – you can rely on your partner in everything. Working with freelancers you can hire a single person at once only. And if the further need appears, you just need to look for someone else again and again. But the development company gives you a whole team of highly skilled in different fields professionals. Cooperation with the company allows you to feel the simplicity of communication with experienced project managers and satisfaction of reading the reports. No rush, no hassle, no failed deadlines – only professionalism, quality, and perfect production. Each company is a legal business entity. They are ready to provide you with the list of documents you would want to take a look at to make sure they are reliable partners. Web development company would support your website, fix bugs and take care of its updates, So, not only the development but all of the further problems are taken care of. We could not indicate more than this one issue. Company’s services cost much more in comparison with the freelancer’s. But as it was mentioned above, the market is full of attractive offers all over the world, and you can as well hire a company that meets your requirements completely. But consider also the fact that the development company is able to even save you money in case of the fruitful long-term cooperation. What else is there to talk about, we are ready to name a winner: web development company would be the best choice when it is about a development of the website. Let this tiny table be a help for you in making the right choice of the partner. Remember: your potential partner’s experience has to cater to your needs. One should have strong skills in software design and development, management, QA, communication etc. And what is even more important, one should be as interested in your product’s quality as you are. So there is no better choice than a web development company in terms of painless processes and the end quality. Here, at Sloboda Studio, we work with cutting-edge technologies that would take your business to the top. Our dedicated team of skilled professionals would fulfill any of your ideas and provide you with the qualified support even after the implementation of the website is finished. We care about our customers’ ideas and we are ready to show you how it feels like to be the best. Stop hesitating and become the front runner with Sloboda Studio.